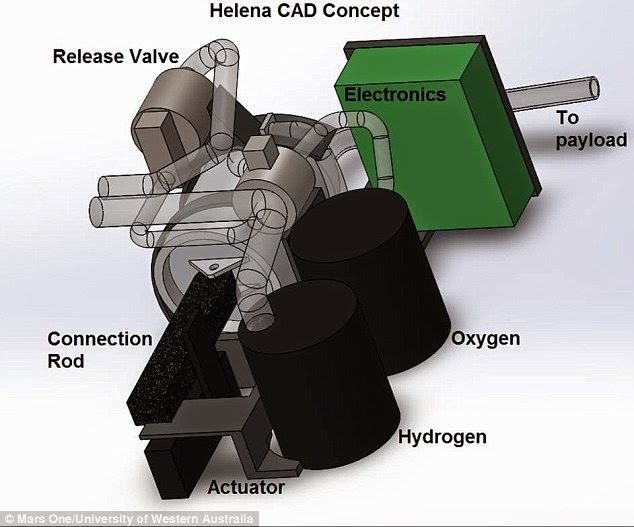 The Helena payload aims to demonstrate a key-life support technology for humans, using electrolysis to produce oxygen from water extracted from Martian soil. The device will extract water from the Martian soil using electrolysis - which is method of using a direct electric current (DC) to drive a chemical reaction. 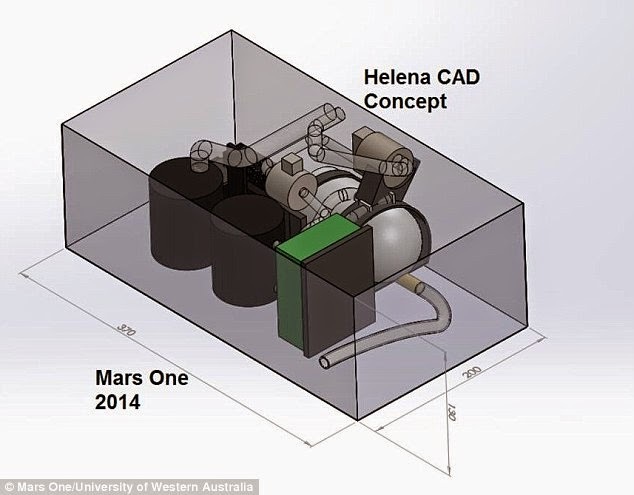 Designed by the University of Western Australia and Mars One astronaut candidate, Josh Richards, Helena is one of ten finalists in the Mars One University Competition. Its main piece of equipment is an electrolysis chamber that works alongside a pressurising mechanism, oxygen sensor and pressure release valve. The device extracts water from the Martian soil using electrolysis - which is method of using a direct electric current (DC) to drive a chemical reaction. Electrolysis will see the production of hydrogen and oxygen in their elemental state. Electrolysis will see the production of hydrogen and oxygen in their elemental state. The Helena, named after the Shakespearean heroine who 'breathed life into stone', uses electrolysis to produce oxygen from water extracted from Martian soil. Helena will also carry a 'time capsule' in the form of a radiation-hardened DVD filled with messages and art by the public. The project, which is named after the Shakespearean heroine who 'breathed life into stone', could be the first example of life-support technology on the surface of Mars. It aims to refine technology that will allow humans to survive on the red planet, before the arrival of the Mars One colonists in 2025. 'Our experiment will hopefully pave the way to ensure the survival of the elected astronauts on the red planet, as we attempt to produce oxygen from Martian resources,' said Helena co-lead, Andre Van Vulpen. Other entries include 'Cyano Knight', a German project that is aiming to change a small amount of the 95 per cent carbon dioxide Mars atmosphere into oxygen using cyanobacteria. Another entry from the UK will see a small greenhouse built on the red planet to attempt to grow lettuce for astronauts in a pressurised environment.